One of HomeSweetBees.com readers contacted me about getting 30-40 bees a week for therapy for a bad back. Although it has not been scientifically proven, some people say applying bees to a certain area of the body helps with arthritis and other medical conditions. 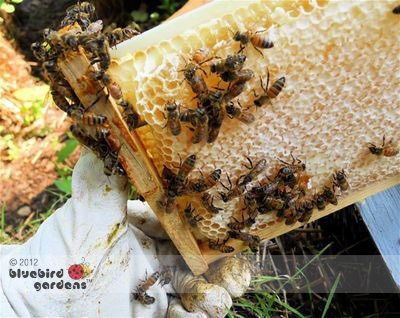 Most beehives in Missouri are at their lowest numbers through winter. Beekeepers are not going to open a hive, and expose it to moisture and cold weather, to remove just 30-40 bees a week. Bees form a ball in the center of the hive and make it through winter literally shivering themselves warm. Although a worker bee may only live for 4-6 weeks during summer, worker bees over winter may live as long as 6 months to get the colony from one season to the next. Experienced beekeepers tell me people who need bee stings for on-going therapy usually set up an "observation hive," or a hive that's inside with a vent access to the outside so beekeepers can more easily get to, and remove, the needed quantity of honeybees. Sorry, all of my honeybees are adopted! Honey is very versatile. One of its best properties is attracting, and retaining moisture. One of the best treats to give yourself after a hard day is a warm bath with 1/4 cup honey. I just pour it out of one of my little recycled jars with the gold tops. Considering it took 12 bees a lifetime to make one teaspoon, honey really is very precious. Soak for 10-20 minutes. Bring along a book - I'm currently reading "The Secret Life of Bees." My friend Paul in Washington DC has a wacky sense of humor. When he led one of his recent emails with "don't look now but your honey has been laundered," I thought he was sending me a link to some weird news story about a beehive making it through a car wash. The link was to Food Safety New's early November 2011 findings that 3/4rths of imported honey sold in grocery stores doesn't qualify as honey. As I understand the issue, it boils down to having detectable pollen, which means the honey source can be identified. In the U.S., the Food and Drug Administration says any product that's been ultra-filtered and no longer contains pollen isn't honey. In addition to being a great natural sweetener, honey has a multitude of benefits that many people don’t know about. Manufacturers have used honey in everything from hand lotions and moisturizers to bar soaps and bubble baths. One reason they use honey is for its wholesome, all-natural image; more and more consumers are demanding cosmetics and personal care products made from natural ingredients. Honey is a humectant, which means it attracts and retains moisture. This makes honey a natural fit in a variety of moisturizing products including cleansers, creams, shampoos and conditioners. Look for honey in store-bought beauty products or simply add a squeeze of honey to your moisturizer, shampoo or soap at home. For some extra pampering, try whipping up a simple beauty recipe yourself. I will share some of my personal favorites! Americans consume 1.5 pounds of honey per person annually. They don't guestimate how much bees eat a year. There are more than 300 types of honey in the United States alone although I wonder how they count it because my bees have never made the same tasting-honey twice. We all know a drop of honey in tea is good for a sore throat, but you can also add honey to most drinks for an extra energy boost. How do you like to eat honey?